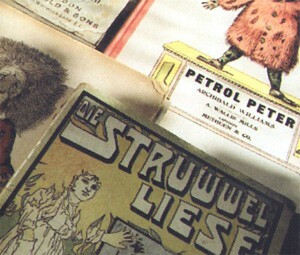 Friends of Struwwelpeter Museum was founded in September 1995 to support and advance the museum, which is devoted to Dr. Heinrich Hoffmann (1809-1894), great reformer in the treatment of the mentally ill and author of Struwwelpeter (1845) and other children’s books. The museum is operated by the frankfurter werkgemeinschaft, an organization dedicated to aiding in the reintegration of the mentally ill and the mentally handicapped. An annual membership meeting, held at the museum, is well worth the trip to Frankfurt – even from overseas. Membership (2016: 30,00; 2017: 40,00 € per year), and open to Struwwelpeter enthusiasts everywhere) includes the annual newsletter STRUWWELPOST. STRUWWELPOST is a MUST for keeping in touch with the Struwwelpeter scene. It has news about activities at the museum, articles on Struwwelpeter and Heinrich Hoffmann topics, and Struwwelpeter news from everywhere: previews and reports of exhibitions and other events, and lists of new books and articles in periodicals. STRUWWELPOST is edited by Dr. Walter Sauer, Neckarsteinach, Ulrich Wiedmann, Pfinztal, and Beate Zekorn-von Bebenburg, Frankfurt. World-wide interest in Struwwelpeter and STRUWWELPOST can be seen in contributors from such countries as Canada, Finland, Norway, Sweden, Russia, Poland, Mauritius, Holland, etc. Do you want to join the Friends of the Struwwelpeter Museum ? Do you need further information ? Please contact the Struwwelpeter Museum.